After yesterday's flamboyant festivities with George IV, we're celebrating another royal birthday today. It's not quite as wild a party though, as Queen Adelaide was a little bit more subdued than Prinny. Born in Germany as the daughter of George I, Duke of Saxe-Meiningen and Princess Luise Eleonore of Hohenlohe-Langenburg, Adelaide grew up in the highly democratic state of Saxe-Meiningen, which covered less than 500 square miles. An intelligent and charming young lady with a deep religious faith, Adelaide shunned the glamour of society in favour of a more homely life. However, she would one day travel far beyond her native land, eventually finding herself on the throne of England. 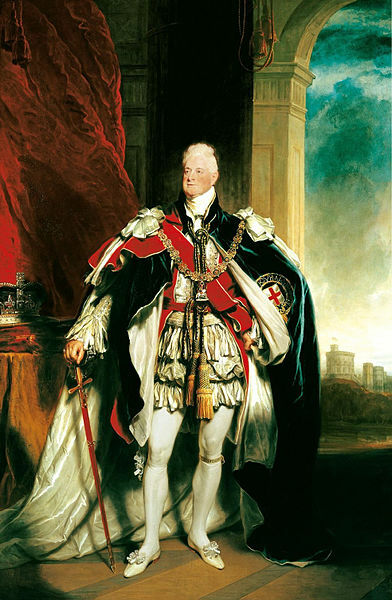 George IV was very fond of theatricals and his brother, Prince William, Duke of Clarence, was no different. Though unmarried, his liaison with actress Dorothea Jordan had produced a number of illegitimate children, but no legal heirs. He cast his regal eye over the likely candidates for marriage and, spurred on by the promise of a fat parliamentary payout in return for a respectable bride, eventually settled on Adelaide. She was a little way down his list of preferential candidates and almost three decades his junior, but the match was made. Adelaide travelled to England in summer 1818 and met her husband-to-be at Grillon's Hotel in Bond Street on 4th July. A week later she and William were married in a double wedding at Kew Palace alongside Prince Edward, Duke of Kent, and Victoria, Dowager Princess of Leiningen. The ingredients were all in place to create a recipe for disaster: an arranged marriage, a huge age difference and a marriage to secure a throne and financial settlement. However, against all odds William and Adelaide were to become a happy couple. Whilst George was drowning in debt in England the newlyweds made their home in the far more affordable Hanover and lived a quiet life, with Adelaide by all accounts improving her husband's temper and curing a number of bad habits! The couple were overjoyed when Adelaide fell pregnant in 1818 yet their happiness was to turn to tragedy when the baby, Charlotte, was born prematurely, dying just a few hours later. A second miscarriage followed in 1819 and in 1820, the couple's four month old daughter, Elizabeth, died after complications from bowel disease. Further tragedy followed in 1822 when Adelaide delivered stillborn twin boys and though rumours persisted of pregnancies, there were to be no further children. Despite a bitter feud with her mother, the Duchess of Kent, both William and Adelaide were devoted to their niece, Princess Victoria of Kent (later Queen Victoria) and the young girl was fond of her aunt and uncle in return and would remain so throughout her life. By the time of George's death in 1830, William and Adelaide had returned to England and were happily ensconced at Bushy House. 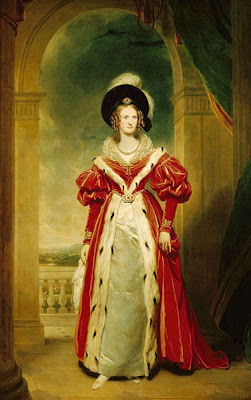 Unlike the vitriolic scenes at Westminster Abbey when Caroline of Brunswick tried to be crowned alongside George, William and Adelaide attended the coronation together. Whilst William played the buffoon throughout the ceremony on 8th September 1831, his devoted wife behaved with utmost dignity and won the respect and admiration of all present. After the profligacy and scandal of George's reign, Adelaide and William were popular monarchs, representing a return to the less extravagant style of George III and Queen Charlotte. Adelaide performed a number of charitable deeds and donated large sums of money to further her charitable interests. Although apparently not interested in political manoeuvring, rumours were rife that the Queen heavily influenced her husband's decisions in favour of her own Tory opinions. In 1837 the King fell gravely ill and his wife nursed him for nearly two weeks at Windsor Castle, remaining constantly by his side until he died on 20 June. The Queen Dowager remained beloved of the public through the remaining years of her life, and after her death was buried with her husband at Windsor according to her own wishes, "free from the vanities and pomp of this world.". There is a beautiful sculpture of the baby Elizabeth as a sleeping child in Frogmore House, Windsor Great Park. Had the child survived she would have become Queen Elizabeth II and the whole reign of Victoria would not have happened! Thank you, Arturo; a subtle shift that would have changed the entire monarchy! I love that fact that she travelled to London to meet her prospective match on a sort of blind date on 4th July! Some parts of this remind me so much of Diana! Homely, politically influential... etc. A happy Hanoverarian marriage too, not something we might have come to expect! I knew all too little about Queen Adelaide, Madame. Thank you for an interesting and enlightening post. A pleasure; she is something of a neglected figure, I think, stuck between the notorious George IV and the legendary Queen Victoria! I wonder what the Queen thought of Mrs Jordan and her"royal brood"? I can certainly hazard a guess! 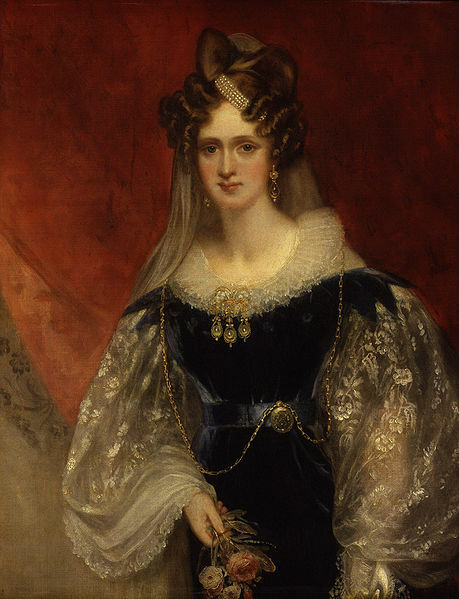 I suspect that Adelaide made a more comfortable mother-figure for the young Victoria than her real mother did. Perhaps her influence has been underestimated by Victoria's biographers. Certainly she set an example of domestic felicity. That's an interesting angle, and one I could certainly agree with! I think she looked after her husband's brood (if I remember correctly). She was portrayed by the wonderful Harriet Walters in the film "The Young Victoria" starring Emily Blunt and Rupert Friend as Victoria and Albert. You do indeed remember correctly; a favourite queen of mine.